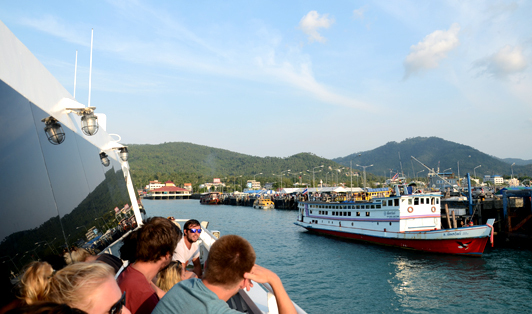 Nathon Pier is Samui Island's main ferry port and serves as the key arrival/departure point for Samui travelers. Situated in the northwest of Samui, tourists will be able to find trips from Nathon Pier to any of the amazing surrounding islands such as Koh Phangan and the local dive capital, Koh Tao. Nathon Pier itself is a really sturdy passenger zone, which is able to accommodate the hundreds of people hopping on and off ferries at any given time. Many times per day, great big car ferries dock and depart with ease, as well as the multiple ocean-going tour and transfer ferries and boats. Local facilities are good; you will find a variety of hotels, banks, restaurants, tour desks and shops just over the road past the pier entrance. Taxi's will be awaiting you with eager anticipation but be aware that although they may have meters, they will not likely be using them and it is wise to haggle them down to a more reasonable price than is first quoted! The road system's a bit weird with it's slightly crazy-mazy system, so be prepared and go easy if you're ready to hire a vehicle and go it alone!